I love this palette and the way you’ve used it. So tempted to get one myself. I’m not sure about that blue though, how would you use it with the other colours? I am stuck in a brown/bronze/gold eyeshadow rut. I realised that I too was mostly stuck in a bronze/gold shadow rut… but I’m loving it and don’t wanna leave, especially now Autumn is drawing near with all it’s bronzey shades! So, instead I thought I’d spice it up a little by using the blue in the palette foiled (wet) as a liner. 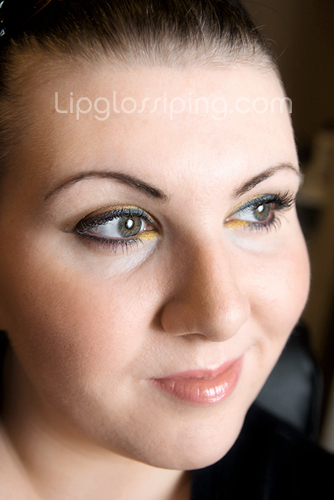 I *think* it works, although I’d probably use the same gold on the lower lashline as I did on the lids next time. Hope the shadows aren’t too distracting, I did this quite late at night and had to use my (bounced) flash to light my face. Looks really good, love that shade of teal with grey eyes, sets them off a treat! I love it too! A really wearable way of incorporating blue into your day look! That’s fabulous. Totally going to try and copy it!